Robert Burke's home on the web. The Fast Picture Viewer codec is free, works on 32- and 64-bit Windows, and has since become my go-to codec for raw (NEF) images on both Windows 7 and Windows Vista. Earlier this year, I wrote about the where, why and how of Nikon Raw (NEF) Codecs for Vista and Windows 7. In the intervening months, my fellow photographers have introduced me to a shiny new alternative called the Fast Picture Viewer codec, which is free, works on 32- and 64-bit Windows, and has since become my go-to codec on both Windows 7 and Windows Vista. With this codec installed, you get Raw image support in places like Windows File Explorer, Windows Live Photo Gallery, and Windows 7 Media Center. And it’s surprisingly fast. Here’s a link back to my updated earlier article, which explains the codec story in more detail. Or you can just go download the Fast Picture Viewer codec. Microsoft tech Bonus: It was created by a BizSpark startup. 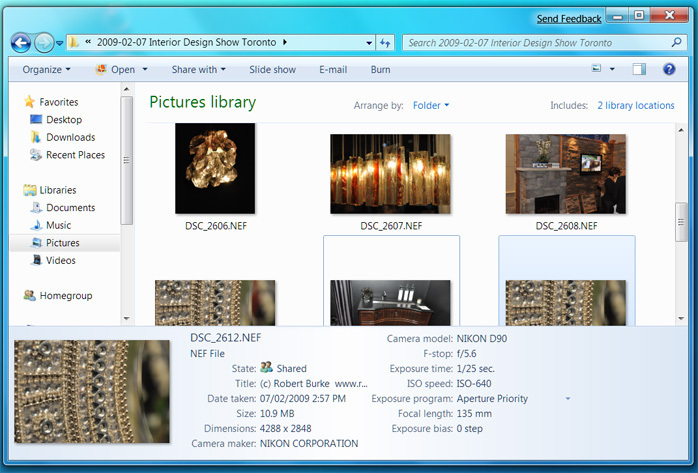 The goal: a directory of Raw (NEF) Image files and their metadata in Windows Explorer. This is 64-bit Windows 7. Two years ago, I mentioned in an article that Nikon’s Raw (NEF) Codec was an important part of my photo-processing pipeline. After many laptops, photos, and software updates, it still is. I now work with photos on 32- and 64-bit machines running Windows 7 and Windows Vista. In the hope it will help other Nikon photographers, here is an update describing some of my more recent experiences working with Raw (NEF) files under Windows. First – Why would you want a NEF Codec? The principal reason you’d want a Raw (NEF) Codec is to view Raw Nikon images and metadata from within Windows File Explorer and Windows Photo Gallery, and now Windows Live Photo Gallery as well, which was released as part of Windows Live Essentials. Of course, if you’re shooting Raw images, you’ll probably also want a fully-featured application that can view and edit NEFs (such as Nikon’s Capture NX 2, or Adobe’s Lightroom or Photoshop), in addition to the Codec. But the Codec itself is very useful for viewing, sorting and “triaging” your photos. The options available to you for NEF Codec solutions will depend on whether you’re running 32- or 64-bit Windows. Here are the ones I use today. Nikon’s Codec has gone through a number of revisions. It is currently at version 1.14, and can be downloaded from here. This codec is free to download. I should note that I couldn’t get it to work on a pre-release version of Windows 8. My impression (not even remotely scientific, since I’ve switched machines and cameras) is that version 1.8 is quite a bit quicker and more robust (stalls less often) than earlier versions. My improved experience may also have to do with updates to Windows Vista, so I’m not sure. In addition to the Fast Picture Viewer, another third party, Ardfry Imaging, have released a 64-bit NEF codec for Windows Vista x64. I have previously worked with it on multiple 64-bit Windows 7 installations, and it worked well for me. I evaluated the Ardfry Codec beta for its trial period, and decided it was well worth the $19USD they were asking for a registered copy. But what if I don’t want to pay for (or install) a Codec? Please note that even if you choose not to install a codec like FPV or Ardfry’s, Nikon’s Capture NX 2.1 works fine under 64-bit Windows (in 32-bit emulation mode), as you can see in the screenshot of 64-bit Windows Task Manager below. That being said, I value being able to see my photos and their metadata within Windows Explorer and Windows Live Photo Gallery, which is not possible without the codec. So a codec solution like the ones listed above makes sense for me. The Windows 7 installation pictured at the top of this article is sporting the Ardfry codec. I hope this helps, and am always grateful for tips, advice, and further thoughts on streamlining my photography pipeline.